Liberty’s Emma Humenay (3) puts up a shot while being defended by Newark’s Katie Shumate (14) during the first half of Monday’s non-league showdown in Powell. Junior Morgan Sharps scored a game-high 17 points, surpassing the 1,000-point milestone on a three-pointer in the fourth quarter. But, the game had long been decided by that point. 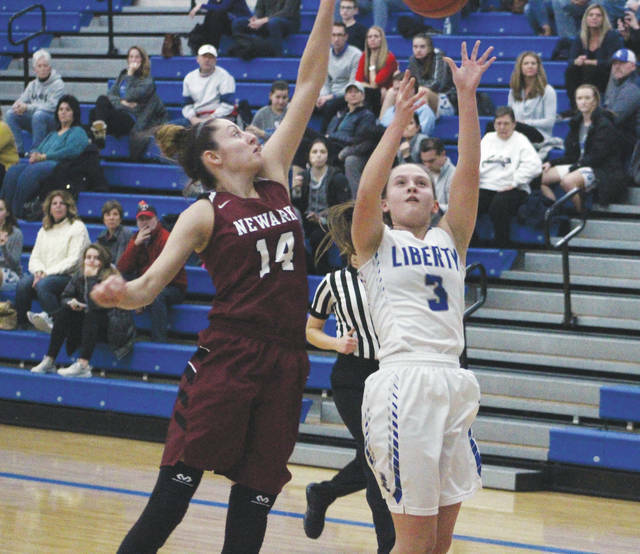 The Olentangy Liberty girls basketball team couldn’t overcome a scoreless first quarter in a 56-35 loss at the hands of top-ranked Newark Monday night in Powell. Newark put 14 on the board in the opening stanza led by Sharps’ five points and four more by Katie Shumate all while pitching a shutout, forcing nine turnovers in the process. Liberty scored five quick points to open the second on an Emma Humenay three and a Lauren Spicer basket underneath. “We told the kids, ‘Once the ball goes in the net, we can settle in and go on a bit of a run,’ and we kind of did there a little bit,” Krafty said. But, Newark responded with eight straight to push the lead to 17. Sharps beat the first half buzzer with a three to give Newark a 33-13 lead at the break – one of seven first half treys by the Wildcats (20-0). It seemed every time Liberty hit a three, Newark responded. Humenay hit on back-to-back possessions, but Emma Shumate responded to the first before a Gabby Stare basket gave Newark a 42-21 lead. “We could never close the gap much, but every time we seemed like we were kind of getting into a spot where it was manageable, they’d come down and hit a big shot,” Krafty said. Liberty never got within 20 again. Newark pushed the lead as high as 26 in the fourth quarter. Stare and Emma Shumate had 10 points apiece and Katie Shumate added eight for the Wildcats. Humenay led the Patriots (10-11) with 12 points, all on threes. She landed hard against the wall padding trying to block a layup attempt in the fourth quarter, but returned a few minutes later. Liberty closes out the regular season at home against Westerville Central in OCC-Buckeye action Friday night at 7:30 p.m.
It’ll be the first of back-to-back games between the two. The Patriots, seeded 23rd in the district tournament, visit 11th-seeded Central Feb. 17 in the first round.